The 2016 WNBA Draft saw a bit of history (UConn players going 1-2-3), a few trades (Minnesota-San Antonio and Connecticut-Los Angeles) and 36 players fulfilling their dreams of being drafted as a professional basketball player. With all of the names called, all of the photos taken, all of the interviews granted and all of the travel plans arranged, let’s take a look back at Thursday’s draft and see how each team did in addressing their needs. There was no drama surrounding what the Seattle Storm would do with the No. 1 pick in the draft. Of course they took Breanna Stewart, who enters the WNBA after having one of the most remarkable college careers ever — a career that included four national titles, four Final Four MOPs and three AP Player of the Year honors. The 6-4 forward with a 7-1 wingspan and guard-like skills and shooting range has a game that should translate seamlessly to the WNBA. In the third round, the Storm added guard Lexi Eaton Rydalph, who was a scoring machine at BYU — she ranked fifth in the nation at 24.2 points per game. Stewart and Eaton Rydalph join a Storm team rebuilding around young talent (ROY Jewell Loyd, Kaleena Mosqueda-Lewis, Ramu Tokashiki) and veteran leadership (Sue Bird, Crystal Langhorne). With point guard Danielle Robinson sidelined for the season following Achilles surgery, the Stars selected Moriah Jefferson from Connecticut with the No. 2 pick in the draft to help fill the void. Jefferson, the floor general for the UConn squad that made history with its four national titles in four years, brings her playmaking skills, three-point shooting and defense back to her home state of Texas. The Stars then traded veteran guard Jia Perkins to Minnesota in exchange for Jazmon Gwathmey, who was selected with the second pick of the second round. A 6-2 center from James Madison, Gwathmey brings post scoring (20.7 ppg as a senior) and interior defense (173 career blocks) to add to the Stars’ depth on the frontline. Finally, the Stars added Brittney Martin, a 6-0 guard from Oklahoma State, with the first pick of the third round. The first round of the 2016 WNBA Draft was dominated by a pair of Connecticuts — the University made headlines by becoming the first school to produce the top three picks in the draft, and the WNBA team finished with three of the top six picks in the draft to help bolster their roster. The Sun selected Morgan Tuck of UConn at No. 3, followed by Rachel Banham and her Mamba blood at No. 4 and finally executed a trade with the L.A. Sparks to land the Jonquel Jones with the No. 6 pick. The Sun were not done after dominating the first round; they also grabbed a pair of guards — Oregon State sharpshooter Jamie Weisner in the second round and St. John’s Aliyyah Hanford in the third round. Aerial Powers left Michigan State with one year of eligibility still on the table and the Dallas Wings are glad she did. Powers is a dynamic wing that can score and rebound — she averaged 17.5 points, 10.1 rebounds and 2.0 steals at MSU — and should be able to slide in nicely next to the backcourt of Skylar Diggins and Odyssey Sims. The Wings also bolstered their frontline with the addition of 6-6 center Ruth Hamblin, the two-time Pac-12 Defensive Player of the Year, who just helped lead Oregon State to its first-ever Final Four. The Wings rounded out the draft with the selection of guard Shakena Richardson, the first player from Seton Hall ever selected in the WNBA Draft. After selecting forward Jonquel Jones with the No. 6 pick in the draft, the Sparks traded the rights to Jones and a second round pick to Connecticut for Chelsea Gray, the 15th and 23rd picks in the draft and a first round pick next year. Gray, the 11th pick in the 2014 draft sat out the 2014 season while recovering from a knee injury, averaged 6.9 points, 2.3 rebounds and 2.7 assists in her rookie WNBA season and will look to be the answer at point guard in L.A. With the two second picks the Sparks got from Connecticut, they selected a pair of guards with three-point range in Whitney Knight from Florida Gulf Coast and Brianna Butler from Syracuse that should help bolster their 29.7% 3-point shooting from last season — the second-worst mark in the league. L.A. finished its draft night with the selection of forward Talia Walton from Washington with the 29th pick in the draft. In our draft preview, we suggested that Washington could just be looking for the best player available and that it could be a player that is a stout defender ready to contribute to coach Mike Thibault’s scheme quickly. Well, that pretty much happened with Kahleah Copper of Rutgers being available when the Mystics selection came up on the board. Copper is a 6-1 athletic forward that can guard multiple positions and provides Thibault with a versatile perimeter player to add to his rotation. In addition to Copper, the Mystics selected Lia Galdeira with the 19th pick in the draft. Galdeira played collegiately at Washington State before playing this past season in the Bulgarian League. She is a proven scorer (23.9 ppg in Bulgaria last season), that will compete along with third-round pick Danaejah Grant from St. John’s for roster spots over the next month. 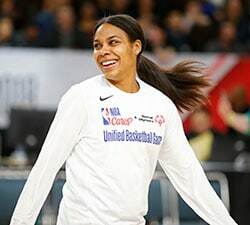 The Mercury had no glaring needs coming into this draft, as they boast one of the league’s best rosters — a pair of 2015 All-WNBA players (Brittney Griner and DeWanna Bonner) and returning three-time champs Diana Taurasi and Penny Taylor. The only need the Mercury really have is adding young depth to its veteran roster, particularly at guard, and they did just that with the selection of Courtney Williams from South Florida with the No. 8 pick in the draft. Williams is an athletic guard that is a proven scorer (22.4 ppg and 38.2 3P% her senior season) and capable perimeter defender that joins a team ready to compete for another WNBA title this year. Phoenix’s second round pick — Jillian Alleyne of Oregon — will not be playing this season as she recovers from a torn ACL. It’s not often a team that went to the Finals can get a player in the following draft that can come in and contribute right away, but the Fever may have just done that with the selection of Tiffany Mitchell with the No. 9 pick in the draft. Mitchell, a three-time All-American at South Carolina, is a 5-9 guard that can score the ball (14.9 ppg her senior season) and shoot the three (40% for her college career). 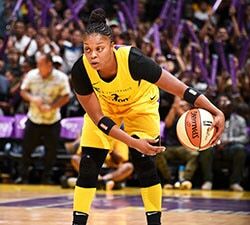 With the Fever losing Shavonte Zellous to free agency, Mitchell could fill the void as the backup guard behind Shenise Johnson and Briann January. The Fever added point guard Brene Moseley from Maryland in the second round and took a future project in 19-year-old Julie Allemond from Belgium in the third round. The Sky were surprised and thrilled that Imani Boyette was still on the board when their No. 10 pick came up on the board. They quickly selected the 6-7 center from Texas to help bolster their interior defense. Boyette is an athletic 6-7 with a huge wingspan that should make an immediate impact in rim protection and rebounding, while her offensive game takes time to develop. But considering the Sky feature the league’s top scoring offense and the scoring champ in MVP Elena Delle Donne, offense is not what they need from Boyette at this point. The Sky stayed in Texas for their second and final pick in the draft by selecting Texas A&M guard Jordan Jones in the third round. The Dream had a run of three selections over a six-pick stretch spanning the end of the first round and start of the second. They used those picks to grab a pair of scoring guards — Bria Holmes of West Virginia at No. 11 and Courtney Walker of Texas A&M at No. 16 — and a 6-4 center with a knack for blocking shots in Rutgers’ Rachel Hollivay at No. 13. The Dream rounded out their draft by getting the nation’s assist leader Niya Johnson (8.7 per game) of Baylor in the third round. The Dream accomplished their goal of adding depth to their backcourt and frontline with this draft. The Liberty finished last season with the best record in the league, thus entering the draft with the last pick in each round. With no glaring needs to fill, the Liberty added Adut Bulgak, a versatile 6-4 center from Florida State that has the ability to run the floor and shoot from the perimeter, with their first-round pick. In the second round, New York took Ameryst Alston, a scoring guard out of Ohio State that could bolster the Liberty’s 10th-ranked offense if she is able to make the team. With the final pick in the draft, the Liberty took Shacobia Barbee of Georgia, who is currently out after suffering a broken leg during her senior season. The Lynx entered the 2016 Draft without a first-round pick and without any real needs to fill on a team that just won its third championship in the past five years. 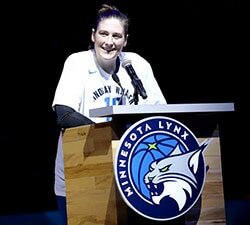 With back-to-back titles on their mind, the Lynx used their first pick in the draft — No. 14 overall — to select James Madison’s Jazmon Gwathmey and trade her to San Antonio for veteran guard Jia Perkins, an 11-year pro that averaged 13.3 points in 24 starts for the Stars last season. The Lynx held on to their final two picks — Tennessee forward Bashaaara Graves at No. 22 and USC center Temi Fagbenle — with Graves competing for a roster spot and Fagbenle forgoing the season to finish school.